Yume mirrors can be hung horizontally, vertically, or in larger sizes, placed on the floor. Yume mirrors are presented with two frame versions, namely, polished aluminium and black oxidated, making the collection suitable for any environment, both domestic. 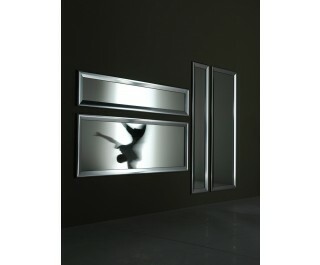 Mirror with non-machine edge, 4 mm thick, protected by self-adhesive polyethylene safety film. In the event of breakage, dangerous shards of glass do not come loose. Extruded frame made from anodized or black varnished aluminium. Frame 30 mm thick. Felt pads for resting on the wall and floor.